La Pergola Terraza is a gourmet / formal restaurant offering Mediterranean cuisine. The average price of a main course dish at the La Pergola Terraza restaurant is 12 euros. The average price of a 3-course meal at the La Pergola Terraza restaurant is 25 euros. Note that although GoMadrid.com strives to maintain all information about La Pergola Terraza up to date, the prices mentioned are only an indication and may not reflect the exact value of your meal. Two different places for the winter months and summer ones, including a wonderful terrace area to celebrate meals and exclusive dinners with natural light. The restaurant also enjoys 3 multifunction lounges, all of them with natural light. Ideal for meetings and family celebrations. Ideal for business people working in the area, who wish to enjoy a pleasant terrace café atmosphere in the Arturo Soria area of Madrid. Also suitable for families and private celebrations. Extensive menu with many different tapas to choose from, varied salads and typical dishes of Spain. If you decide to sit down for dinner, the wide range of fish and grilled meats will be a pleasant surprise, always deliciously garnished and exquisitely presented by the chef. There are also menus for groups, family celebrations and banquets, with main dishes such as vichyssoise of chive, varied hors d'oeuvres, baked salmon with mushrooms sauce, petite Iberian sirloin steaks with raspberry sauce, monkfish in American sauce and cod ajoarriero amongst others. The desserts in particular stand out for their originality and home-made elaboration. There is also the possibility of taking the buffet. 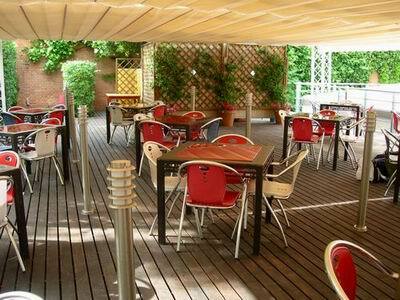 The address of the La Pergola Terraza restaurant is: C/ Arturo Soria, 14, 28007 Madrid. The nearest Metro station is Cuidad Lineal. Please see the La Pergola Terraza restaurant location map below.